15 Day Guided Package " Complete Kimberley"
This package allows you to explore the Kimberley in the safety and comfort of a a purpose built small group 4WD. Your guide is professional and knowledgeable and your stay in remote wilderness areas are in purpose built safari tents and luxury accommodation. Gone are the days of putting up your own tent, sleeping on the ground, and fumbling around in the dark using temporary toilet facilities. Arrive in Broome and be transferred to your hotel. Enjoy your day at leisure to explore this fascinating place. Broome suffered numerous attacks by the Japanese during World War II, and there are a number of remarkable and poignant sites to visit in this historic pearl diving town. Marvel at the sites of ancient plant fossils and dinosaur footprints, dating back to the early Cretaceous period. Indulge with a delicious Welcome Dinner and meet your fellow like-minded travellers and Driver-Guide. Day 2: Broome, Derby, Gibb River Road, Tunnel Creek, Windjana Gorge. Day 3. Bell Gorge, Hiking and Swimming. Back on the Gibb River Road, you travel through Outback landscapes to Bell Gorge, where rugged cliffs surround a series of tiered waterholes. The afternoon is yours to explore the spectacular scenery. Take a swim below the waterfall which feeds the lower pool or go birdwatching. The energetic can choose from a number of hiking opportunities. This is the perfect place to simply relax and enjoy the surroundings. Head back to the wilderness camp and relax before dinner. Day 4. Galvans Gorge, Barnett River Gorge, Drysdale & King Edward River. Today, you travel through the heart of Kimberley cattle country to discover some of the regions most secluded gorges. At Galvans Gorge, a short walk leads to a picturesque waterhole, with Boab trees clinging to the escarpment above. Inspect the rock art on the gorge walls and take a leisurely swim. You stop at the Mt Barnett Roadhouse before travelling to beautiful Barnett River Gorge, where you can enjoy lunch in a setting of shady paperbark trees. Look out for the birdlife that inhabits the area and enjoy another dip. Turning off the Gibb River Road, travel north on the Kalumburu Road, heading towards the isolated Mitchell Plateau. Arrive in Drysdale and enjoy a truly unique stay at this historic cattle property. Ascending the Mitchell Plateau, you enter a remote world of Livistona palm forests, beautiful lookouts, ancient Aboriginal art, magnificent waterfalls and isolated swimming holes. Today, explore amazing Wandjina and Gwion (Bradshaw) rock art galleries and swim in the crystal clear waters near King Edward River Crossing. For the next two nights, stay at a permanent wilderness camp beside Pandanus palm fringed Camp Creek. Enjoy this unique location at the top of the plateau. For wildlife watchers, the region’s prolific birdlife includes brolgas, herons, kites and sea eagles, as well as some rainforest birds. You may be lucky enough to see the Monjon, a rock wallaby that is unique to the Kimberley region. Day 6. Mitchell Falls, Scenic Flight over the Falls. Today you have a full day to discover the beauty of Mitchell Falls, with a magnificent system of waterfalls and Aboriginal art. When available, local Aboriginal guides will join you for the adventure, imparting their knowledge of the area and sharing their cultural beliefs, which are closely linked to this stunning environment. Begin with a guided hike to Little Merten Falls to view rarely seen Aboriginal art. Continue on to view Bradshaw art and Big Merten Falls before arriving at Mitchell Falls. With superb scenery and rich culture, you can swim in the pools above the falls, learn of local history and look for the region’s stunning wildlife. Package includes a special helicopter flight over Mitchell Falls back to the vehicle (or, if you prefer, hike back with your guide). Longer scenic helicopter flights over the remote coastline are available at an additional charge. Day 7. Mitchell Plateau, Gibb River Rd, Home Valley Station. Rejoin the Gibb River Road and ford the mighty Durack River before arriving at Home Valley Station, an immense cattle property. Discover the spellbinding scenery that captivated audiences in Baz Luhrmann�s movie �Australia�, including the imposing yet strikingly beautiful backdrop of the Cockburn Range. Here you�ll enjoy an overnight stay in this inspirational setting. Day 8. Home Valley Station, El Questro Station, Emma Gorge. Gain fun-filled insight into the operation of a working cattle station on the Home Valley Station Tour. Discover Home Valley�s Indigenous training project and see where the movie �Australia� was filmed. APT guests will enjoy a customised tour of the cattle station and gain insight into the work that the Indigenous Land Corporation (ILC) do here. Later, cross the Pentecost River into El Questro Wilderness Park, covering a staggering one million acres. Hike to the picturesque Emma Gorge and take a revitalising swim. Tonight, absorb the serene surroundings before indulging in a delicious dinner with your fellow travellers. Day 9: El Questro to Kununurra. Relax with a soak in the hot pools of Zebedee Springs amid lush surroundings. You then head to the town of Wyndham and take in spectacular 360 degree views from Five Rivers Lookout. Enjoy lunch at an iconic Outback pub before visiting Parry�s Lagoon, a bird watcher�s paradise then	continuing to Kununurra. This morning you have some free time to explore the township of Kununurra. Then, you travel to Lake Argyle, the largest man-made lake in the southern hemisphere with 18 times the capacity of Sydney Harbour. This afternoon, join a guided 55-kilometre cruise on the Upper Ord River to Lake Kununurra. Keep an eye out for the wide range of wildlife that inhabits the area, including fruit bats, crocodiles and a myriad of birdlife. Admire the scenery as the sun sets over the lake. Day 11. Purnululu (Bungle Bungle) National Park, Echidna Chasm. Departing Kununurra, you travel to Purnululu National Park. A spectacular wilderness region and home to the unique Bungle Bungle Range, the park was awarded World Heritage status in 2003. Today explore the northern part of the park. Hike into Echidna Chasm, a spectacular cleft in the rock massif. Enjoy the experience of staying within the national park without having to ‘rough it’. .
Day 12. Cathedral Gorge, Beehive Domes. Explore majestic Cathedral Gorge today, making sure you test out the acoustics of this natural amphitheatre. Walk down the ancient dry river bed of Piccaninny Creek and marvel at the unique beehive domes. Learn about bushtucker, bush medicine and the area’s significance to local Aborigines. There is time for an optional helicopter flight for a birds’ eye view (own expense). Enjoy drinks and watch the sun set over this magnificent range. Farewell the Bungle Bungle and visit historic Halls Creek. See China Wall, a natural formation of white quartz projecting above the surrounding rocks and winding over tens of kilometres. This afternoon head to Fitzroy Crossing on the banks of the Fitzroy River. Day 14. Geikie Gorge Cruise, Broome. Enjoy an active morning exploring Geikie Gorge, where annual flooding has created a bleached effect on the sandstone walls. Our unique cruise is guided by a traditional Aboriginal land owner. After lunch, we travel to Broome. Relax on Cable Beach or discover the delights of Cable Beach Resort and Spa as you enjoy your day at leisure. Take a beach walk, enjoy a free art and history tour, including a Sidney Nolan collection, or take an early morning Yoga session, held in the resort�s Buddha Sanctuary. Later, be transferred to the airport for your flight home. 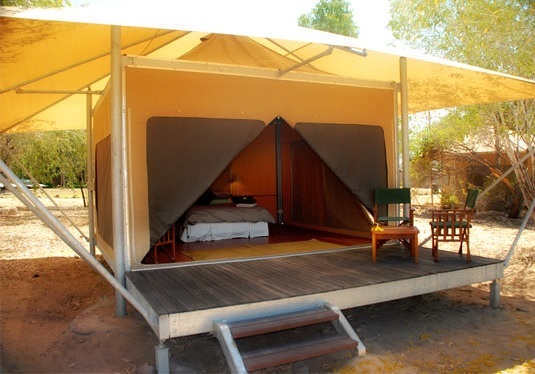 1 night Safari Tent at Emma Gorge with ensuite and nearby bar & restaurant.